Since being posted back in April my post titled Linking Excel and AutoCAD with Data Links has been one of the most visited pages here on The CAD Geek Blog. In that post I go through what I will call the manual way of linking an Excel table to AutoCAD. Thus unless you are a part of the Slowskey family, you’ll likely prefer this quicker more efficient way of making the link. Start off in Excel by simply selecting the cells you want to link to AutoCAD. Right-click and select “Copy“. This will place the Excel table on your clipboard so we can paste it into AutoCAD. Open the AutoCAD drawing you wish to insert your Excel table into, and go to the “Edit” menu, selecting “Paste Special”. From the resulting dialog box, Select the “Paste Link” radio button, and then select “AutoCAD Entities” under the “As” heading. Select an insertion point for your table, and just like that you have a table which is linked to AutoCAD. If you have “DYN” turned on (available from status bar) you will see some helpful information when you hover over the table. First notice the two icons in the Northeast quadrant of your cursor. The padlock icon to the left indicates that the table is locked. What that means is changes to the Excel document will be updated in AutoCAD as well, however you cannot make a change in AutoCAD and it update Excel. The second icon is supposed to be two chain links. That is letting you know the table contents are being red from an external Excel table. Finally if you have dynamic input (DYN) turned on the southeast quadrant of your cursor will show some information about the data link associated with the table. 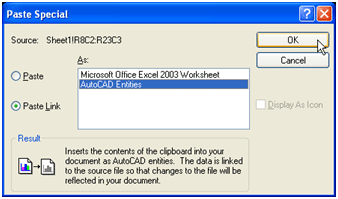 AutoCAD automatically generates a Data Link when you use the Paste Special method, hence the Excel Data Link 1 name. Other information like the path to the linked Excel table and what cells are being displayed is among the data previewed. Under “Data Links” select “Open Data File“. That will load Excel, and take you to the linked Excel document. In my humble opinion that method is a lot easier than unlocking the cell(s) you want to modify, changing the data, and then writing back to the data source. Finally if you’re in a drawing, and the Excel document gets modified. AutoCAD will not update the table in real-time. You could close and re-open the drawing, but a little easier method is to select the table > right-click > “Update Table Data Links”. Hi, I would like to link values from a table imported from Excel to the area of pline. Is this possible? what about the mac version that does not have paste special command? I was updating a excel file adding more cells and data, when I updated the link in AutoCAD the font of the new cell were almost twice the size. Is there a way I can control that? Thank you very much indeed for the guidance. Why does the table in autocad revert back to the original size it was brought into from excel when you edit a cell in excel? I formated my Excelt document to look how I wanted and when I bring it in to autocad all the rows and columns are different than in my excel, also I am not able to white out certain cells. Any idea why this would be happening? I like your explantion of how to insert excel tables into AutoCAD 2008. My questions is this. Why is it that the romans font in excel look and prints horribly. I personally don’t mind using arial because that prints just fine, but the old timers like romans. out very ugly or have of the leter disapears. I want to link Autocad to an Excel file to creat a interior of materials. I want to link Autocad cells to an Excel file to creat a Build of materials. For every cell I put into a Autocad I want it to add the cell information to the Excel file. Can this be done? I don’t make comments like this unless I’m truly grateful for a to the point solution. I’m 71 years old but still learning. Your three point method of getting Excel data into Acad has just saved me hours of work and improved the quality of the Acad presentation no end. I’ll use this method for the forseeable future. All the very best to you and people like you. first of all, sorry for my bad english, but it’s not my native language, I’m live and work in Croatia! So, because of lack of the special literature here in Croatia, and my trying to find out with this problem, I’m decided to write to you. So, the problem is how to create some curves from datas in excel. Let me be more precisely, it’s problem how to create izocromatic curves of tension in material, which are in its native hiperbolic curves, but it’s less important. For me is important, how to make close polilynes in auto cad from datas in excel, from tables in excel, which is divided on x coordinate and y coordinate. after lingkling data from excel files, i am fail to find the changes in colors with numerical digits. is it possible if color changes in excel files for a particular cell, will it also be reflected in auto link file? Thank you very much, Mr. Donnie. It's hard to say what's going on without being able to actually see the issue. Nonetheless, I am currently running Windows 7 64 bit with AutoCAD 2011 64 bit, and Office 2007 32 bit, and haven't had any issues with data links. It's a slightly different take on this post, but here's a post I did about a month ago using that 32 bit/64 bit setup (http://thecadgeek.com/blog/2010/04/28/autoc…). With regard to a data link created on a 32 bit machine; I personally haven't run into any issues as this feature has worked the same for me in both 32 bit and 64 bit environments. This does not work in Acad 2011. I believe it is because I am running 64 bit and excel is 32 bit. Really, really crappy. I wonder if someone else attaches a datalink in a 32 bit envirnonment and I open it, if it will work? Is there any way to change which data link a table uses? I have a drawing with multiple schedules that are identical in size, format, etc, and only vary in the data. In Excel they are set up as multiple sheet tabs in the same file (Sheets A, B, and C). I have made multiple Data Links, one for each sheet (linkA, linkB, linkC) What I want to be able to do in AutoCAD is to copy my table to make several instances of it, then change which Data Link each one is attached to. I looked at the “Edit Data Link..” button in the Table toolbar, but that changes which Excel Sheet a specific link references, not which link a table is associated with. I can’t make individual tables and pair up the Data Links correctly from the start because on the AutoCAD side my formatting is too complex – I tried making a template but it doesn’t pick up all of the formatting. Any ideas? I’ve just recently started to use the OLE link with excel and autocad. i believe we are using autocad 2004, and excel 2003. My question is this, the spreadsheet links with my drawing just fine, but when it plots every cell has a border. I only want the cells that I’ve placed the borders around in my spreadsheet to plot. Any advice??? I’m having the same problem as Kim! The page setup in Excel has the gridlines box unchecked. Kim & Jenny – While OLE objects will work with AutoCAD 2004, the process outlined in this post will only work with AutoCAD 2008 or above. As for taming your OLE objects in earlier releases, I’d try a couple things and see what happens. First, try applying a White fill to the cells in Excel. If that doesn’t work, try applying a white border (again from inside Excel). Unfortunately with OLE’s there’s not much you can do on the AutoCAD side, most of their display configuration comes from whatever application the OLE is linked from. I just tried the steps to link an Excel spreadsheet to AutoCAD and I don’t have the option to add the data as a link with AutoCAD entities when using the “Paste Link” radio button. Any thoughts? Beegee – If you’re using AutoCAD 2007 or older; you won’t have this option. The AutoCAD Excel Linking feature was introduced in AutoCAD 2008.
is it possible to change the text height / text width of the table in autocad? The Autocad / Excel is working pretty well for me, but I found out that if I cannot update the columns or rows. If I linked Autocad and excel with only 2 columns and 69 rows and then insert more rows and columns into my excel spread after I have linked it to Cad, the Cad file will not update the columns or rows, nor the content inside. I know I can start over and relink, but it will take a lot of time to set it up in the proper configuration. Is there away to update the columns and rows after linking. @Mai – Unfourtionately I do not currently have a post on the topic, but the command you want to take a look at is EATTEXT. It will scan your DWG per some basic instructions, and output in a number of ways including as an AutoCAD table. Dena – The rows/columns you select for the copy/paste operation will the the ones linked. Thus if you omit the rows/columns you don’t need, you won’t see them. Is there a way to control which column/rows display in the cad file. I have blank rows that I don’t need and colums that have been omitted. I have tried setting the print area in excel to display the exact area I want to show up in cad but no luck yet. @ Freddy – I have found it easier and less buggy to just do your updates in Excel. It’s hard to say what exactly has gone kaput in your DWG. @ Kerwin – Sounds to me like an issue with the pen table you’re using. There shouldn’t be any difference between a hard-copy and a DWF copy. How come the table lines are printed in gray color other than solid black line when creating dwf file? 1 data link(s) do not allow their data to be written out. While I find it very handy that imported Excel files will automatically update when pasted properly into AutoCAD 2008, one thing that I have noticed is that all of the Excel Data Links are listed permanently in the drawing file as External References. Even when I have deleted an Excel link from a drawing that is no longer required, there is still a record of it shown in the External References list (Status will read “Not Found”). Is there any way to delete unused Excel Data link records from the External References Window? I’ve been using the Data Links manager to input excel tables- they operate very similarly to the PASTESPEC method. However, I am running into a formatting issue. My row height is locked to some arbitrary value and nothing I change in excel modifies it, but the column width changes according to the excel file. Any ideas where I can find this setting and modify the row height value without having to manually change the height of all the table rows? Once the excel spreadsheet is in the dwg – formatting is next to impossible. cells containing data derived from formulas in excel import into cad as txt font, the rest in arial, plus a decimal and 4 zeros. my favorite trick match properties is useless and the decimal and zeros won’t delete! am i missing something obvious? Greg – I don’t remember the specific limitations of AutoCAD 2005. No less, I personally haven’t run into said limit in AutoCAD 2008. Frankly, I have been rather satisfied with the improved Excel AutoCAD relationship introduced in the 2008 release. While special pasting a link from excell in AutoCad 2005, there is a limit to the number of columns and rows that you can link at one time. Is there a limit on the number of columns and rows “LINKED” in AutoCad 2008? while trying the paste special option – it only pastes part of the table. Is there a reason it isn’t pasting the whole number of rows and columns? You will not have “AutoCAD Entities” as an option under Paste Link unless you are running AutoCAD 2008 or newer. I am not finding Auto cad entities under As heading in Dialog box , what is the reason? I presume you’re pasting things as an OLE Object (ie not an AutoCAD Table). Much like the setting for images, OLE objects have a frame option. The command (system variable actually) is OLEFRAME. I’d suggest setting that to 2 which will display the frame in the drawing, but will not plot it. I have recently switched from Auto-CAD 2005 to 2008 – – and I have been using the paste special command for sometime but I can not get the border to stop printing in the newer version i s there a setting to turn this option off? Barny – since the intriduction of tables we have been able to create a single-cell table. To that end, we should be able to select a single cell in Excel, and link it to AutoCAD. As for doing it with a script – that I am not sure about. I personally haven’t played around with the command line options of the data link commands in 2008. Is it possible link a autocad MText to one excel cell using a script? Maybe something like FileName.xls!.Sheet!.CellN! …. Did somebody ever tryed something similar to this? When importing an excel (2003) schedules with images within them into Autocad 2008 the cells with the images plot solid black. The excel sheets are imported using the paste special\paste link feature as a Microsoft Office Excel Worksheet. The plotter drivers are the most current and AutoCAD 2008 is up to date also. Is there something in the .pc3 file under graphic that I need to set? We are using a XEROX 510 laser plotter. When importing an excel (2003) schedules with images within them into Autocad 2008 the cells with the images plot solid black. The excel sheets are imported using the paste specialpaste link feature as a Microsoft Office Excel Worksheet. I was trying to link the excel spread sheet to the AutoCAD drawing and was not able to select the “paste link function”. The “paste” function was automatically selected and the “paste link” function is shaded gray to where you can’t select it. Could you possible go into detail how I can solve this? Very interesting, what you have found about Excel tables. Do you know how can I save a viewport rendering?, I can not do that in AutoCAD 2008, “saveimg” does not work. I will apreciate any information about it. Thanks.